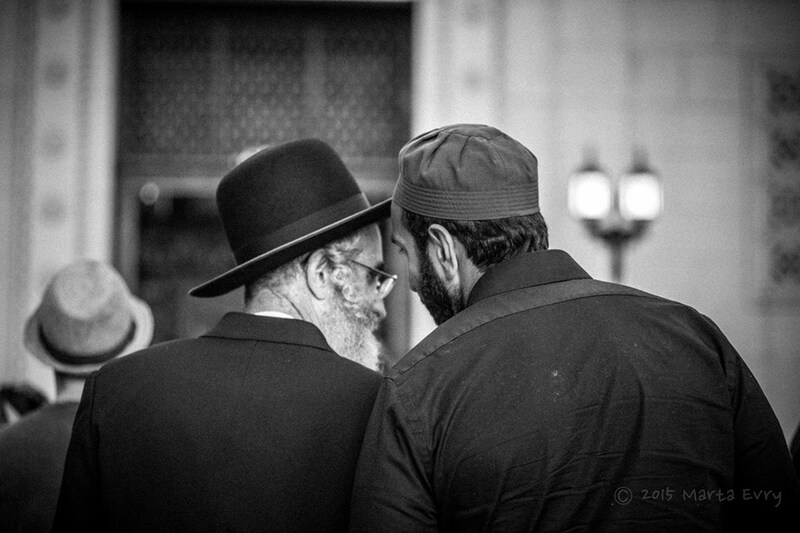 Two Faiths One Prayer was borne out of our experience as fellows of NewGround: A Muslim/Jewish Partnership for Change. As part of the fellowship — an eight month conflict resolution, leadership training, and interfaith learning program — we participate in two weekend retreats. During bi-monthly sessions and retreats, we learn about each other’s religions, histories, and build strong connections and friendships that help dissolve whatever blinders we may have previously worn. On our first retreat, after sharing our traditions of Shabbat and Isha, we realized that our prayer times intersected, and that perhaps, instead of praying in separate spaces, we might share a prayer space. Though our rituals and avenues of connection are different, our G-d and our goals are the same. The experience was profound for both participants and observers. Those praying expressed a heightened sense of focus and intention in their prayers, and those observing reported a feeling of unity and deep connection. 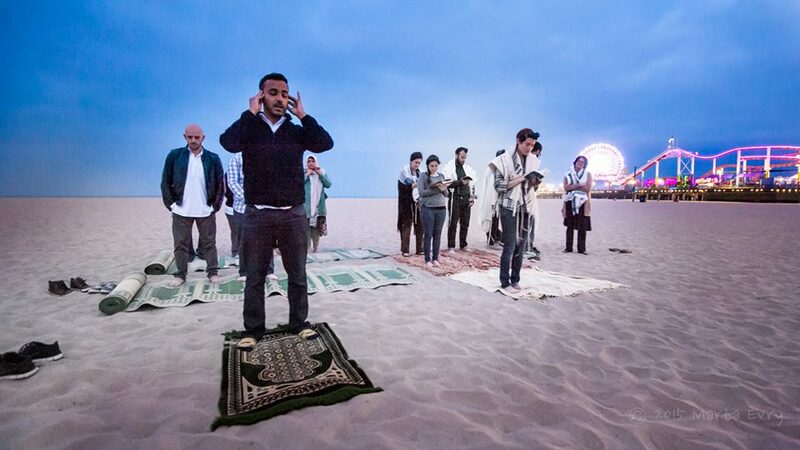 We were surprised by the resonances and sense of “call and response” between the prayers of the two traditions. This experience led us to experiment more inside the small, safe space of the fellowship. But then we began to see our experiences as they connected to other efforts happening around the world. We were first struck by the swell of support in Chapel Hill after the shooting deaths of three Muslim students – and the number of people in the Chapel Hill community who came out to pray. Several weeks later, Muslims came to encircle the Oslo synagogue in solidarity on the Shabbat following shootings at a synagogue in Denmark. "So inspired, we now seek to design a safe, sacred space for others to experience what we felt (and what was, perhaps, felt by the communities in Chapel Hill and Oslo) — or at least to witness that it’s possible for Jews and Muslims to come together in prayer. We hope that people of our own faiths, and others, will realize that we are praying to the same One G-d who sees each of us as unique human beings worthy of dignity and respect." Our #2Faiths1Prayer short documentary has been viewed by over 26,137 viewers on YouTube and over 33,283 people on Facebook — that’s a total of 59,420 total & still counting! The Express Tribune, "Two faiths, one prayer: Muslims and Jews come together to pray"
The Huffington Post, "Muslims And Jews Spent A Day Of Prayer Together And The Result Was Beautiful"
Al-Arabiya News, "Jews, Muslims hold prayer sessions throughout LA"
Egyptian Streets, "Jews And Muslims Unite In Prayer Under Project "Two Faiths, One Prayer""
Linanews, "US Muslims, Jews unite in prayer at Los Angeles beach"
OnIslam & Newspapers, "US Muslims, Jews Unite in One Prayer"
Washington Weekly News,"Muslim and Jews Spent a Day of Prayer Together and The Result was Beautiful"
Muslims for Allah,"Muslims and Jews Pray Together in LA"
Shafaqna, "Two faiths, one prayer: Muslims and Jews come together to pray"
Carbonated, "Muslims and Jews Unite Under Two Faiths One Prayer"
Crowdrise, "Two Faiths one Prayer"
Jewish Journal, "A groundbreaking day of prayer"
Morocco World News, "US Muslims and Jews Pray Side by Side"